A labyrinth is a meandering path, corresponding to a very old rhythmic structure or pattern. Walking a labyrinth helps to focus on personal themes and to come to new insights, but also to come to rest and enjoyment. 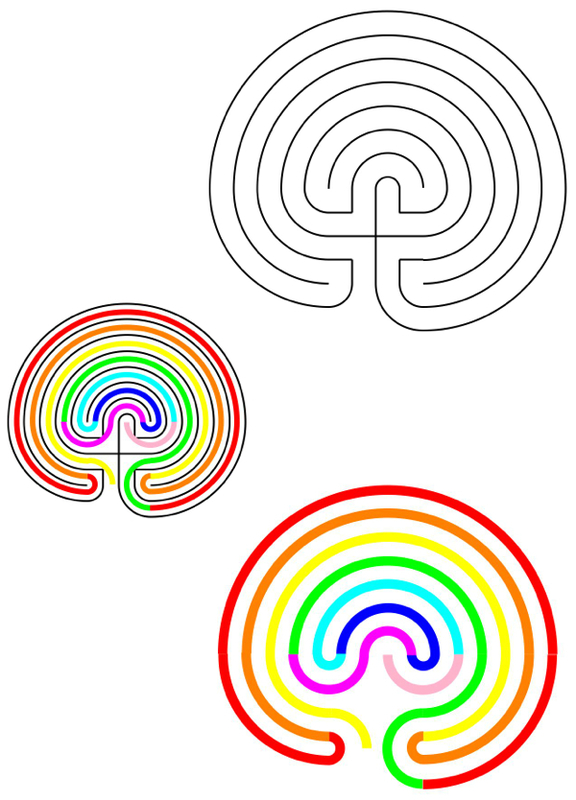 The labyrinth pattern shown here is the Classical seven-circuit labyrinth. The first documentation of this pattern is on a Greek clay tablet of more than 3000 years ago. Through the ages people have used the labyrinth as an instrument of meditation, or to facilitate rites of passage in seasonal or life phase changes. Some people prefer to draw the separating borders of the path, also known as the walls of the labyrinth, the upper picture of the three. 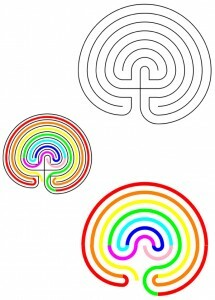 If one enters the labyrinth at the bottom of the graph between the black lines, called the mouth of the labyrinth, the path meanders left and right as depicted in the lower picture through the coloured line. The lower picture depicts the path, the middle picture unites the patterns of walls and path. One can walk the labyrinth without worries of getting lost: Keeping on the path brings one to the centre. The walls are usually just a low separation, not a high hedge that obstructs an overview of the situation like you will have in a maze. The alternation of turning left and right brings balance and stimulates creativity. The labyrinth is a safe space, often even a sacred space. It is a practical tool to improve one’s connection between mind and body, to come to decisions on personal issues and regain energy to implement them – in short – to facilitate finding one’s true expression. The path to the centre takes you along seven circuits in a certain sequence. If the circuits are numbered from the outside inwards, the sequence of the path is 3-2-1-4-7-6-5-centre. The colours used are the colours of the rainbow, the colour of the centre is pink, the colour of unconditional love. Each circuit has a certain symbolic significance, and the sequence of the circuits as induced through the pattern, leads to a process of reflection, relaxation, unburdening, and inspiration. The colours also have a symbolic meaning as I explain in my book. The way out means following the same path in reverse. Most people reflect on their experiences of the inward journey and their stay in the centre. Often they emerge from the mouth feeling energized and ready for action. This is one of the reasons why it is important to make that outward journey too, instead of just sneaking out.